This post is about designing temporary tattoos for photoshoots, film and television, or just for fun. We look at where to get tattoo design ideas (so if you are looking to get inked for real, this next bit might be useful to you) and what to consider when designing a tattoo for a character. There are many online tattoo design websites that have thousands of tattoo designs in all sorts of categories. Some are free, some charge a small fee to download a design and others offer annual membership with unlimited downloading. For those really getting inked, the image offered should be a full colour, high resolution download, meaning that the design can be printed clearly and with great detail, ready to be taken to the tattoo studio for reference. Some sites also provide a stencil with the image, which is used to apply the image outline and main details accurately to your skin. For those creating for a production, you can use the download to print off your own transfers. While you won’t get a handy high-resolution printout or stencil from a book, they can provide lots of inspiration and you get to see the tattoos on people, rather than as a flat template. If you’re not looking for anything really specific or custom designed, you can use ready-printed transfers that come in various designs, styles and sizes. Not as much choice as using a good tattoo design website, but the basic and common tattoos are more than covered, and come in a variety of sizes from small to big. Transfers are often in black and white; some come in full colour. Pre-made temporary tattoos are good for filming continuity, creating a quick or last-minute tattoo, experimenting before getting a real one, or just for fun. Why Does This Person Have a Tattoo? 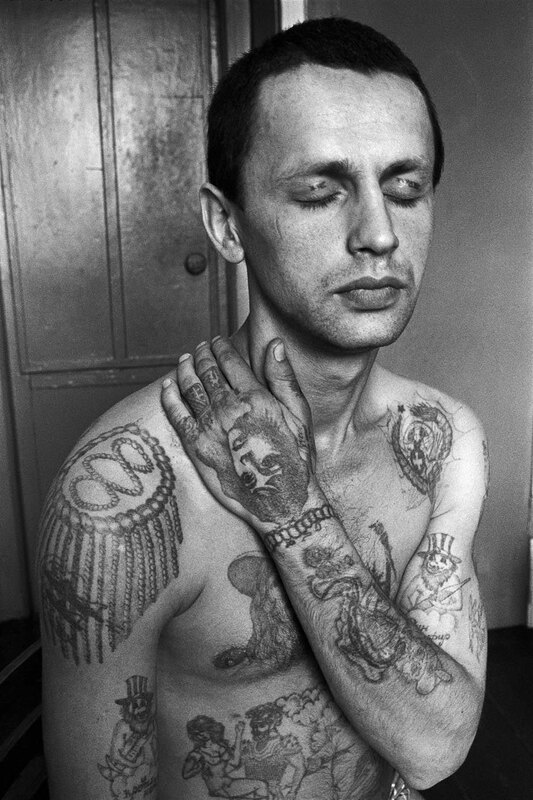 A Russian prisoner’s tattoos, which have meaning and tell a story. Taken from Danzig Baldayev’s fantastic “Russian Criminal Tattoo” book series; a record of tattoos during his career as a prison guard. Being part of an organisation like the military, Merchant Navy, biker clubs, the Freemasons and criminal gangs. Each one may have designs relating to that organisation to show solidarity or involvement. Some tell a specific story or career path e.g. traditional sailor tattoos can have specific meaning, like a dragon showing they’d been to China, or getting a King Neptune tattoo once they’d crossed the Equator – a sailor’s tattoos told of where he’d been and what he’d done. Prison tattoos can be a language, depicting a prisoners history, e.g. in Russian prisons, a cat tattoo signified a pickpocket. Throughout history, tattoos have also been used to mark prisoners, criminals or slaves as identification marks. Sentimental tattoos of family, lovers, pets and friends. As a tribute to a football club, a famous person, to mark an event or happening. Being in a band often involves tattoos! Cultural and spiritual tattoos like tribal markings and religious iconography. Some cultures have a tradition of tattooing e.g the Maori of New Zealand with distinctive patterns and designs, and Berber women in Morocco have a rich tradition of facial tattooing. Other less personal reasons like trends of the day, because they simply like tattoos or they got drunk on holiday and thought it would be hilarious, oh…. and so on. Where is the Tattoo Going to be Placed? Placement is key. No point doing a great tattoo if the costume covers it up the whole time. Certain tattoos are meant to be done in certain places. The script may require it to be kept secret from general view until such time when it gets revealed. A sleeve is where the arm is tattooed from shoulder to wrist. A shirt is just like a shirt or jacket! Arms, back and front torso. A full body suit is an extensive tattoo (usually of a similar pattern, style or theme) that covers the entire torso or the entire body. Real tattoos fade over a long time. The image and its edges become blurry, and the colours dull and merge into each other, leaving a flat, fuzzy and faded tattoo. A fresh, newly-done tattoo will be slightly red around the edges, then develop scabbing. “Onion skin” is where the colours look cloudy until the skin has fully healed for a few days, after which the colours should be clear and sharp. How and Where Was It Done? There are different tattooing techniques, all designed to simply get ink under the skin, from traditional implements like bamboo sticks to modern tattoo guns. 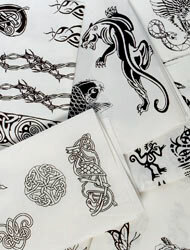 Different countries and cultures can have a different look and feel to the styling of tattoos, as well as the use (or lack of use) of certain colours. Established tattoo artists can have a recognisable style, e.g. 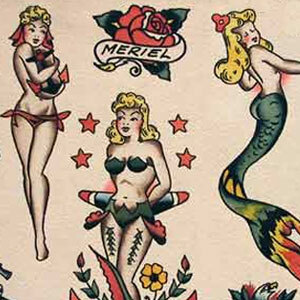 Sailor Jerry whose (now vintage) tattoo designs were found on the skin of many a sailor. 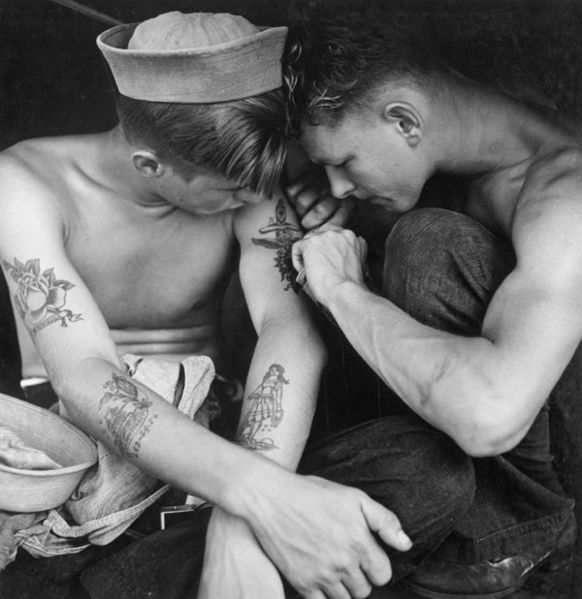 Tattooed sailor aboard the USS New Jersey, 1944. Photo by Charles Fenno Jacobs, from the National Archives. No point doing a modern design if the production is set in the 1940s! For example, tattoos were outlawed in Japan from the start of the Meiji period until after WWII. During this time tattooing went underground – even today tattoos still have a negative image in Japan. Thinking about all the above will dictate somewhat the design options, including imagery options, colours used and the size. The beauty of temporary tattoos is being able to experiment with ideas and having a trial run. Sometimes seeing a tattoo in situ is the best way to gauge what works and what doesn’t. Creating a Temporary Tattoo. We look at tattoo makeup products, the different ways to create a temporary tattoo and looking after your skin art.